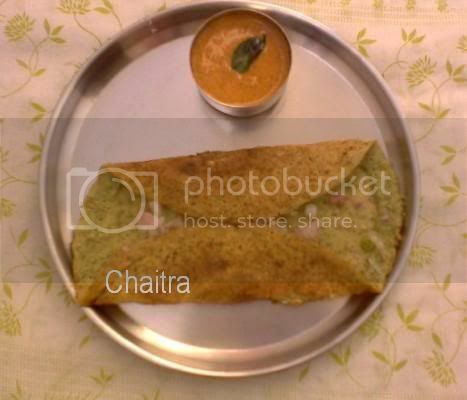 Extremely sorry dear readers for vanishing suddenly.Exams are fast approaching, deadlines are put up for record corrections, preparing notes and other last minute patch works kept me busy and away from blogging.But now i am free so i thought let me post today and catch up the buzz again.So today i am posting our Sunday day starter and Andhra Special~Pesarattu with allam chutney.This recipe is very authentic and straight from my mom's kitchen. Before that tell me how is Aathidhyam's all new Red and Black Look??? Soak green gram and rice overnight.Drain the water and add ginger ,green chillies and salt to it.Now grind the mixture into a paste by adding required amounts of water.Batter should be like Dosa batter.Adjust salt if required.Now heat the griddle/tawa.Meanwhile you can mix all the ingredients for filling and keep it aside.Take a bowl and add 2tbsps each of oil and ghee.Mix it well.Now grease tawa with this mixture and pour a laddle full of the above prepared batter and spread it as thinly as possible(like dosa).Moisten the edges with ghee.Add the prepared filling and cook until brown.If u want it roasted cook little longer.Fold over the sides and serve it. 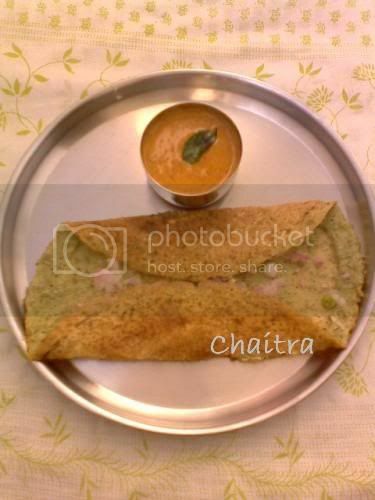 Now you are done with pesarattu and all you need to have is strong filter coffee to keep your mood upbeat! !